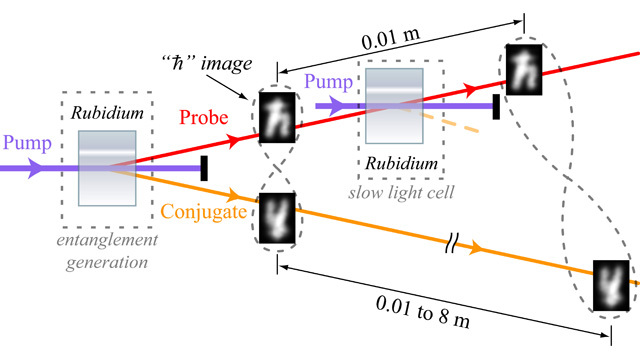 In this simplified representation of the experimental setup for a ‘quantum buffer,’ a cell containing rubidium gas is used to produce a pair of information-rich entangled images. One of the images goes through a second rubidium gas cell and slows down, which is potentially useful for feeding data at properly timed intervals to future quantum computers. The delay can be controlled such that, during the time it takes one image to travel a centimeter, the other image can travel up to 8 meters. Twisted loops illustrate entanglement between the images. Pushing the envelope of Albert Einstein’s “spooky action at a distance,” known as entanglement, researchers at the Joint Quantum Institute (JQI) of the Commerce Department’s National Institute of Standards and Technology (NIST) and the University of Maryland have demonstrated a “quantum buffer,” a technique that could be used to control the data flow inside a quantum computer. Quantum computers could potentially speed up or expand present capabilities in decrypting data, searching large databases, and other tasks. The new research is published in the Feb. 12 issue of the journal (see reference publication). “If you want to set up some sort of communications system or a quantum information-processing system, you need to control the arrival time of one data stream relative to other data streams coming in,” says JQI’s Alberto Marino, lead author of the paper. “We can accomplish the delay in a compact setup, and we can rapidly change the delay if we want, something that would not be possible with usual laboratory apparatus such as beamsplitters and mirrors,” he says. This new work follows up on the researchers’ landmark creation in 2008 of pairs of multi-pixel quantum images. 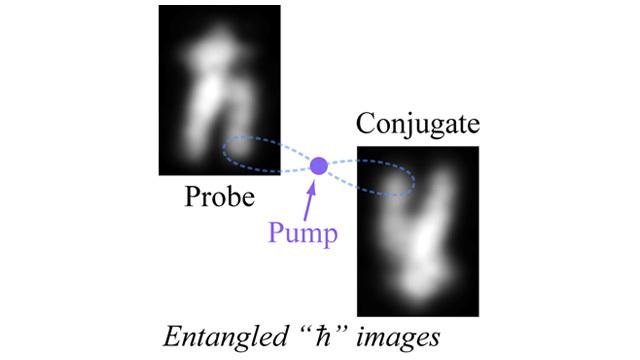 A pair of quantum images is “entangled,” which means that their properties are linked in such a way that they exist as a unit rather than individually. In the JQI work, each quantum image is carried by a light beam and consists of up to 100 “pixels.” A pixel in one quantum image displays random and unpredictable changes say, in intensity, yet the corresponding pixel in the other image exhibits identical intensity fluctuations at the same time, and these fluctuations are independent from fluctuations in other pixels. This entanglement can persist even if the two images are physically disconnected from one another. By using a gas cell to slow down one of the light beams to 500 times slower than the speed of light, the group has demonstrated that they could delay the arrival time of one of the entangled images at a detector by up to 27 nanoseconds. The correlations between the two entangled images still occur—but they are out of sync. A flicker in the first image would have a corresponding flicker in the slowed-down image up to 27 nanoseconds later. While such “delayed entanglement” has been demonstrated before, it has never been accomplished in information-rich quantum images. Up to now, the “spooky action at a distance” has usually been delayed in single-photon systems. “What gives our system the potential to store lots of data is the combination of having multiple-pixel images and the possibility of each pixel containing ‘continuous’ values for properties such as the intensity,” says co-author Raphael Pooser. To generate the entanglement, the researchers use a technique known as four-wave mixing, in which incoming light waves are mixed with a “pump” laser beam in a rubidium gas cell to generate a pair of entangled light beams. In their experiment, the researchers then send one of the entangled light beams through a second cell of rubidium gas where a similar four-wave mixing process is used to slow down the beam. The beam is slowed down as a result of the light being absorbed and re-emitted repeatedly in the gas. The amount of delay caused by the gas cell can be controlled by changing the temperature of the cell (by modifying the density of the gas atoms) and also by changing the intensity of the pump beam for the second cell. This demonstration shows that this type of quantum buffer could be particularly useful for quantum computers, both in its information capacity and its potential to deliver data at precisely defined times.